According to tradition Károly Ferenczy, master of Hungarian impressionism, often rode on his horse towards the sunrise in the surroundings of the painters’ colony in Nagybánya (Transsylvania, now in Romania). He would lie down in the grass on the hills and look at the rim of the vast forest. There the gray tones of the early morning played a mysterious game, until dawn broke and rays of light brought colours to life. This atmosphere inspired him to paint this work. The impressionists favoured painting en plein air, examining the character and changeability of natural light. Ferenczy created a Hungarian version of this plein air impressionism. This resulted in a different kind of painting about the three kings. It is said that he did not start with the theme but with his wonderment at the sun breaking through the dawn. This was his starting point for a painting about one of the best-known biblical stories. As a gifted artist he was not only capable of looking anew at the world around him, but also at this particular theme. He attempted to share what it evoked in him (there are eight studies for this work). The enchanting interaction of light and colour evokes associations with epic stories and days long gone: soft sounds in the half shadow, rustling branches and silk gowns, brocade and horsemen with crown or turban. Forms and colours are brought to life by the pristine morning sun. Across the silky hairs of the horses shimmers a soft-green glow and dark-green shadows of branches lightly play across the figures. The scarlet cloth around the waist of the dark king forms a counterpoint to the many shades of grey and green. The composition has been arranged around this center in calm movement and noble colour harmony. Two kings are sitting solemnly in their saddles, one is leading his horse. They are lost in thought. We see a moment of their journey from the side as if we were part of the forest. The scene has a serene and festive aura. It is breathing expectation, not due to elaborated expression of the figures or the portrayal of their actions, but to its occurrence at the moment of daybreak. It could be a puzzling scene, but we know that the three kings are on their way to the manger. They have been rendered mysteriously rather than regally. They connect the mythical past with the longings of the viewer in the present. They are guided by certainty. And we share with them a fundamental human yearning: to encounter the divine on earth. The sun is shedding its first light and together with the three horsemen we are heading towards the meeting. God is calling and in the silence of the first light we follow our deep desire to meet the Son. 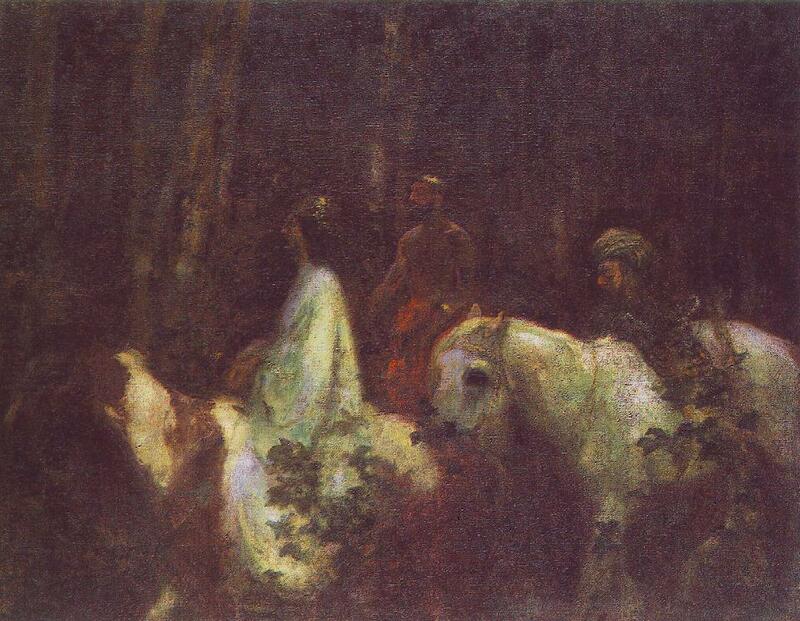 Károly Ferenczy: Háromkirályok (Three Kings), 1898, oil on canvas, 155,5 x 197 cm, Magyar Nemzeti Galéria, Budapest, Hungary. Károly Ferenczy: (1862-1917) was a Hungarian painter and leading member of the Nagybánya artists' colony. He was among several artists who went to Munich for study in the late nineteenth century, where he attended free classes by the Hungarian painter, Simon Hollósy. Upon his return to Hungary, Ferenczy helped found the artists’ colony in 1896, and became one of its major figures. Ferenczy is considered the "father of Hungarian impressionism and post-impressionism" and the "founder of modern Hungarian painting." He has been collected by the Hungarian National Gallery, which holds 51 of his paintings, as well as other major and regional institutions, including the Ferenczy Károly Museum, founded in his birthplace of Szentendre, and private collectors. Aniko Ouweneel-Tóth is a cultural historian and art consultant focusing on contemporary art. She took part in the international project ‘Converting Sacred Spaces’ which was commissioned by the Museum Catharijneconvent in Utrecht, the Netherlands. She is one of the initiators of the Platform for Church and Art. Together with Marleen Hengelaar-Rookmaaker she edited the Handboek voor kunst in de kerk (Handbook for Art in the Church, Buijten & Schipperheijn, 2015). More info: aniko@websophia.com.